MamaEatsClean: Lemon Zucchini Pound Cake - Grain and Sugar Free - with Dairy free options. SO ADDICTING! 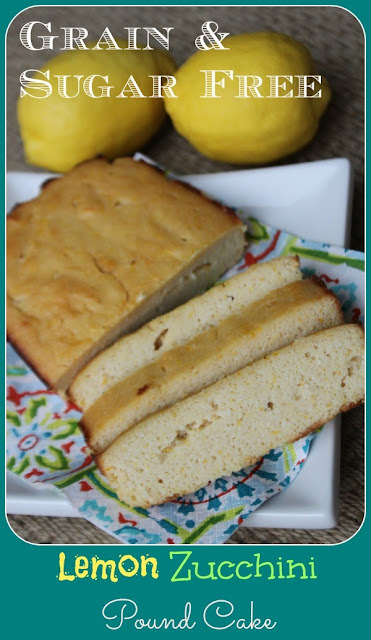 Lemon Zucchini Pound Cake - Grain and Sugar Free - with Dairy free options. SO ADDICTING! This is the most addicting thing I have made in a long time. Keep in mind that I bake ALL THE TIME so that's something. I love this cake. I eat it for breakfast and snacks and dessert. YUMMY! I survived my first week back at work after 14 months of maternity leave. Okay - it was only two actual work days but I also got my kids started off at school and a new daycare so it was one of the those crazy weeks anyway. We are all surviving the transition and the kids are thriving. I myself am fighting a serious bout of low iron and B12 - again - so I'm back in dizzy/tired/spaced out land. I've done some really dumb things this week in my nutrient deprived state - like going to my first day of work with my home laptop instead of my work laptop. And I took the bus so I couldn't rip back home to get the right one. Even more embarrassing is that it took me about 15 minutes and numerous repeated unsuccessful attempts at logging onto the network before I noticed I had the "blogging" computer with ALL THE MISSING KEYS (darn baby). Luckily hubby saved the day and brought me the right one. Anyway, my worst fear about going back to work was how we would keep eating clean. Week 1 - success. Mainly because I had done a bunch of baking and had lots of pre-wrapped snacks to throw in my lunch kit. This pound cake was my FAVORITE snack of the week. I am addicted to this cake. Something about the combination of sweet and tart. And the texture. It is just so yummy. Plus its high in fiber and even has a bit of protein. And zucchini - you know I'm loving zucchini these days. I also made some awesome Banana Chocolate Chip Zucchini Mini Muffins that are gluten, vegan and nut-free that my daughter could take to school. And I made a sugar and grain free chocolate zucchini loaf last week. I have been making pound cakes and loaves, slicing them, wrapping them individually in parchment and freezing them. Then I have snacks ready to go for lunches. Portable snacks. Yummy snacks. It can be done. But will the momentum continue or is this just a back to school high I'm flying on that will fade out once we get settled in? Who knows? Stay tuned to find out.......................and wish me luck! Grease a loaf pan with butter AND line with parchment paper. Add wet ingredients to dry ingredients and mix until just combined and no lumps remaining. Let stand for 10 minutes to let coconut flour absorb liquids. Bake for approximately 50 minutes or until knife in center comes out clean. YMCA Ang? Oh I miss you around there. I keep hoping to run into you but we don't seem to cross paths. Hope your transition is also going well! And I really do hope to run into you soon.